A US that’s a world beater on manufacturing costs? It could be, according to the just published Boston Consulting Group (BCG) report (discussed in The Wall Street Journal, Aug. 30, 2013), about how the U.S. is fast becoming one of the developed world’s lowest-cost manufacturers. The report details how declining energy costs—the result of the shale boom—are giving the U.S. a greater competitive edge globally. As seen in the graph, this translates to a double-digit percentage advantage in key costs by 2015. “The trends are accelerating,” says BCG. U.S. manufacturing is becoming so cost competitive that by the end of the decade it will grab away $70 billion to $115 billion in annual exports from other countries—products that will be made in the U.S. and shipped abroad. The losers: chiefly Europe and Japan. Add to this some manufacturing that will be “reshored” from China, and the U.S. could gain up to 5 million new jobs, including service jobs, BCG forecasts. Productivity gains in the U.S. are another tailwind. BCG looked at 8 low-cost states, primarily in the Southeast, to which manufacturing is already gravitating. 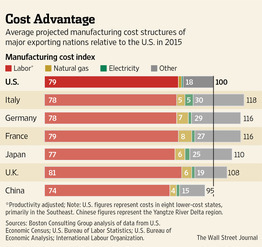 Adjusted for productivity, average labor costs by 2015 will beat Japan by 18%, Germany 34%, and France 35%. The study helps explain why Dow Chemical this week confirmed it will expand its manufacturing operations in Texas and Louisiana, and why scores of other companies—from Siemens to Toyota to Michelin—are expanding U.S. production, too. More than a year ago, Siemen’s CEO stated that cheap energy in the U.S. was already a game changer—the biggest competitive advantage the U.S. has gained in decades. The wholesale price of natural gas in the U.S. has dropped by half since 2005, cutting the cost of feedstock and fuel. By comparison, natural gas costs 2.6 to 3.8 times more in Europe and Japan.